The first house and its ruler signify the native. The twelfth house and its ruler signify the enemy. If the planets are making a challenging aspect, which planet – the lord of the Ascendant or the lord of the 12th – is stronger? 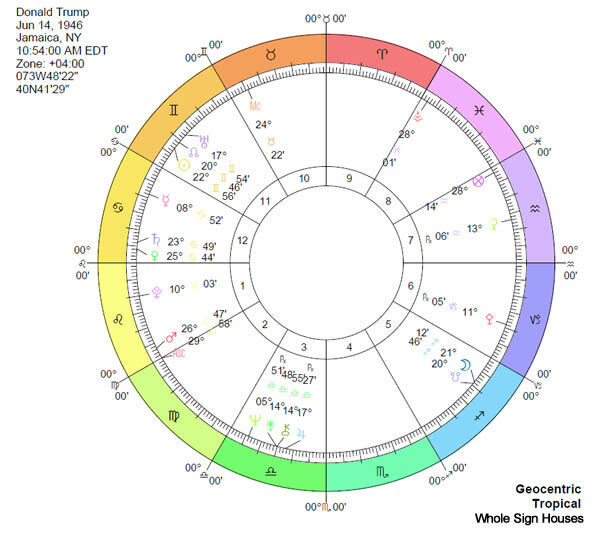 In Trump’s chart, the last degree of zodiacal sign Leo is rising, conjunct the royal star Regulus, which drives his pursuit to be the center of attention at the top in the limelight. Aggressive warrior Mars in Leo is conjunct the Ascendant and with demolition Pluto nearby in the same sign. The lord of the Ascendant is the Sun at 22 degrees in quick-witted Gemini, showing strong leadership in the 11th house of future prosperity and realization of aspirations, fortified by its conjunction to the North Node. For now, we’ll pass over all the 12th house planets with their contributions to the battles and go directly to the Moon, of the Cancer 12th house of enemies at 21° Sagittarius. The Moon, in the medieval texts, represents the common people. Sagittarius brings up the notion of foreigners. (O woe! to all the illegal immigrants and the other far away peoples who need to be put back in their places in order to make America great again). The Moon (the enemy) is weakened by her conjunction to the South Node, and as she moves toward opposing the Sun (Trump), WHAM! and falls back into the South Node black hole of oblivion. This does not mean that Trump will win the election and I do not think that he will. Triumphing over an opponent in a competition (more of a 7th house matter from a traditional perspective) is not the same thing as defeating an enemy who attempts to harm you (12th house). However, it does give an astrological perspective to understand why anyone who tries to attack him seems to be flattened by diminishing in the polls or media while his own ratings soar. At the Colosseum and other arenas, the crowds go ever wilder as their victor scores another and yet even bigger triumph. Since initially writing this article at the beginning of September, the second debate occurred a few nights ago. The pundits gave the match to Carly Fiorina who wisely did not say anything directly negative about Donald Trump, but instead proclaimed that the women all over this country heard very clearly what Mr. Trump has said about her appearance. Perhaps for the first time he was stunned in the face of being slapped by a velvet glove. 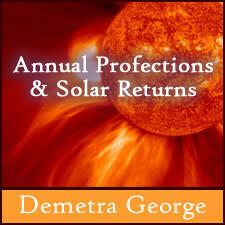 The solar return chart on the birthday provides a snapshot of the coming year; but modern astrologers must decide which of four possible charts to use depending upon choices of precession and location. This lecture will explain a simple Hellenistic timing technique that sidesteps all this confusion and evaluates the solar return within the context of a time lord procedure called annual profections. Learn how to determine which house topic and planetary lord are in charge of the life for the year and how well their natal agenda will unfold during their annual term as time lords. 2014. 1 hr. 11 min. mp3 format. Includes class handout.